I thought I’d duck into Henshaws and see how the wiring was coming along. After dodging a classic 911 set up for weekend racing and slipping past an 87 corvette in the workshop the nomad sat happily in a corner. It looked like it was getting a transplant with the wires resembling veins that will soon give it life. The good news is a lot has happened, starting with the fuse box being mounted up on the inside firewall on the drivers side. 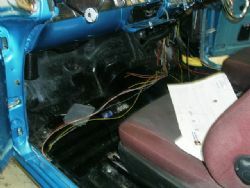 This is the heart – all the wires radiate out from this point and parts of the harness have been run to the front and rear of the vehicle. 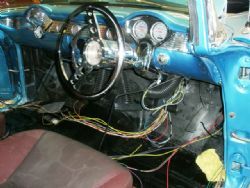 Tri five Chevs have a channel that runs along the inner sill to accommodate the wiring and this has been utilised to accommodate the bulk of the harness. 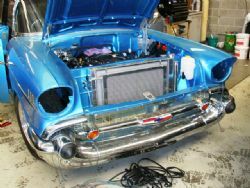 The front headlights and bezels have been removed and the wiring is in place. 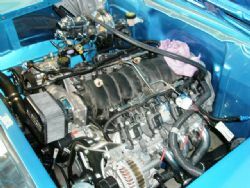 The engine harness now resides in the engine bay which is a pleasant change from the cardboard box it has been in for the last two years. The two interior dome lights are installed and wired up as are the electric windows and switch gear. All the necessary wiring components will be fitted, trimmed to length, earthed and once the puzzle is finalised they will pulled out, tidied up and refitted. The stereo is yet to be tackled and I will need to check the clearance under the front passenger seat to see if we can mount the CD stacker under there as the head unit will fit into a custom made console. The speakers will be mounted in the front kick panels and rear panels close to the rear passenger seat and I have some Chevrolet laser cut outer speaker covers to enhance the rear speakers.